Pets coming along for a stay is negotiable. Please inquire. From Aspen take Hwy 82 toward Glenwood Springs. Go approximately 1 mi past the main Basalt stop light. The concrete highway divider will end, and you will take the first left on to Sopris Ck./Emma Rd. Cross over the bike path and take an immediate left. Continue on approximately 1 mi and take a right at the "T" in the road. Go 5 mi (you will cross two cattle guards) until the road turns to gravel. Two-tenths of a mile further on you will see my driveway straight ahead of you. There is a mailbox on a tire to the left of the driveway. It will have my name "Resnick" on it and the address: 5353 W. Sopris Ck. Rd., Basalt, CO 81621. Head up the driveway 1/2 mi and you will arrive at the property. From Glenwood Springs, take Hwy 82 past the Carbondale exit and on until you pass the Whole Foods on your right (about 20 mi from Glenwood). Continue on through two stoplights and cross a bridge over the river. Take the next right-hand turn on to Sopris Ck./Emma Rd. Cross over the bike path and take an immediate left. Continue on approximately 1 mi and take a right at the "T" in the road. Go 5 mi (you will cross two cattle guards) until the road turns to gravel. Two-tenths of a mile further on you will see my driveway straight ahead of you. There is a mailbox on a tire to the left of the driveway. It will have my name "Resnick" on it and the address: 5353 W. Sopris Ck. Rd., Basalt, CO 81621. Head up the driveway 1/2 mi and you will arrive at the property. Surrounded by wilderness with endless miles of hiking, biking or cross country skiing just out the back door, the property offers seclusion and exquisite views in all directions. Relax in the hammock at the foot of majestic Mt. Sopris, enjoy a campfire while gazing at millions of glittering stars or take advantage of the world-class music and dining options available nearby. 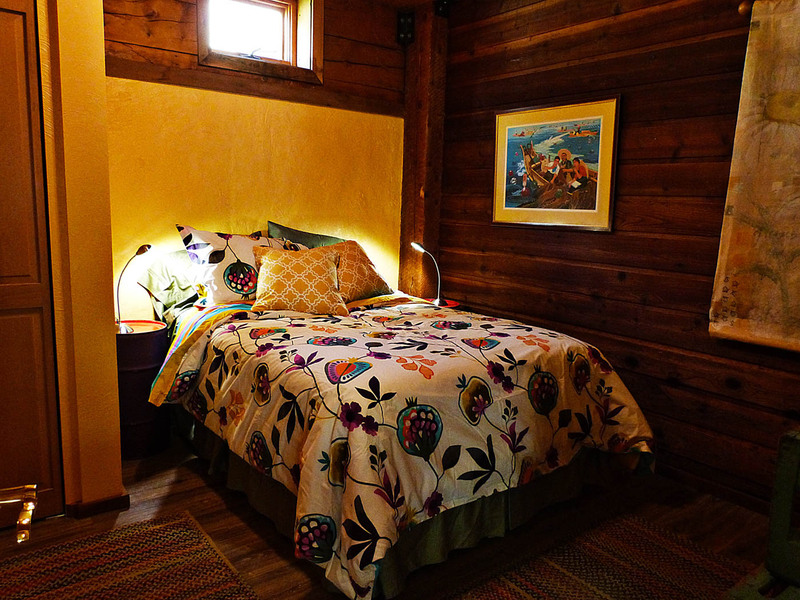 The accommodation is an eclectic mix of log cabin spiced with a unique and colorful artsy flair. The large picture windows bring the outside in so you can enjoy the view in comfort with all the amenities. The property is centrally located between Aspen and Glenwood Springs within short driving distance to ski areas, hot springs and endless outdoor adventure opportunities. Cabin-like feeling but not stand alone—it is part of a larger structure. Your attached cabin has a private entrance and is fully self-contained. It includes a kitchen, living room, dining area and an open floor plan. The winters are gorgeous with sparkling snow, sunny days and the best powder you could ever imagine. Take advantage of the world-class downhill skiing, snow shoeing and cross-country skiing. Spring is vibrant, with the aspen leaves turning a soft lime green and the meadows covered in bright golden dandelions. Summer brings hiking, music, biking, climbing and a profusion of wildflowers in the high country. And then there is fall: Breathe in the brisk, cool air and take in the vibrant, yellow aspen leaves contrasted with a crystal-clear, royal-blue sky and a light dusting of new snow on the high mountain peaks. The valley offers a huge range of dining experiences. From food prepared by world-class chefs to casual bar fare, there is something for every pallet and pocketbook. There are also a couple of distilleries and local brewpubs nearby, which make for fun sampling. There is a full kitchen for dining in and a Whole Foods market only 15 minutes away. No one will go hungry.